Pili multigemini is an unusual hair follicle dysplasia, characterized by clusters of shafts that emerge from a single follicle. It is frequently seen on the beard of adult men and the scalp of children. Circle hairs (CHs) are a hair growth disorder, characterized by asymptomatic presence of hairs with typical circular or spiraliform arrangement, not associated with follicular or inflammatory abnormalities. It is usually seen in elderly, hairy and obese males, predominantly on the thighs. Association of both conditions is not yet reported. An 18-year-old female with pili multigemini and CHs diagnosed on clinical and dermatoscopic examination is presented here. An 18-year-old female presented to us with multiple asymptomatic hyperpigmented lesions over body for 2 months. There was no similar complaint in the past or in the family. There was no history of waxing, application of topical medications or cosmetics, trauma or any oral steroids. There were no features suggestive of atopic dermatitis. The patient was averagely built and did not have a sedentary lifestyle. 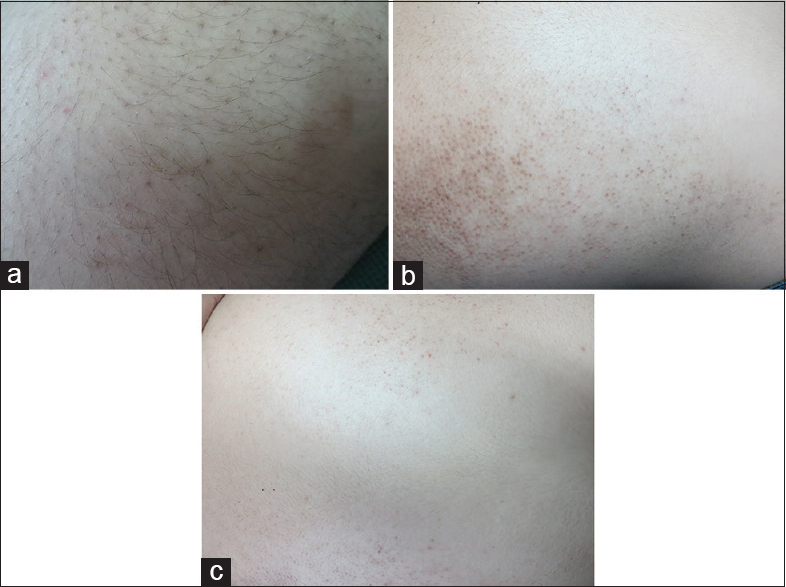 On gross examination, lesions appeared as hyperpigmented papules, but careful examination revealed hair rolled to give the appearance of papules over lateral [Figure 1]a and medial aspect of thighs [Figure 1]b, back [Figure 1]c, and extensor aspect of arms. There were no signs of inflammation. Palms and soles were normal. Clinically diagnosis of CHs was made. Dermatoscopic examination was done which revealed multiple hairs coiled asymmetrically [Figure 2]a. Few circular hairs growing in horizontal distribution beneath the stratum corneum [Figure 2]b. At places, more than one hair was seen emerging from follicular orifices [Figure 2]c which was labelled as pilli multigemini. Biopsy was advised but the patient denied. Pili multigemini is an unusual hair follicle dysplasia thought to be genetic in origin. It is an uncommon developmental defect of hair follicles as a result of which multiple matrices and papillae form hairs that emerge through a single pilosebaceous canal. Its incidence in general population is not known. The strands of hair emerge together through a single hair canal. Normal hair grows from a single hair follicle and exits from one hair canal to the surface of the skin. It has been suggested that a subdivided papilla produce divided hairs or that multiple hairs may be due to the partial merging of several papillae. Other possibility is the reactivation of silent embryonic epithelial germs resulting in multigeminate hairs. A common bulb encloses a dermal papilla that splits into different sized hair shafts with separate cuticles. It mainly occurs on face along the lines of jaw. Tufts of hairs may be seen emerging from few or many follicles. Diagnosis of pili multigemini is visual. In our case, dermatoscopic examination showed two to three hairs coming from single follicular opening. Trichoscopy enhances the evaluation of hair and facilitates the diagnosis of this condition. In pili gemini, kinetic papilla splits at the upper end from single- to double-tipped during the anagen phase and consequently the same follicular matrix produces two different-sized hair shafts having separate cuticles that emerge through a single pilary canal. Treatment includes plucking of hairs, but they may regrow. Ablation with ruby laser can be considered as a therapeutic option. CHs werefirst described in 1963. These peculiar hairs grow in a circular horizontal distribution beneath the stratum corneum as was seen in our case and are considered benign incidental findings. CHs are rarely reported as they are asymptomatic in nature. According to some authors, CH has small hair diameter, unable to penetrate stratum corneum and hence, grow subcorneally in a circular track, while few argue that it is a genetically predetermined disorder. It also corresponds to vestigia (or remnants) of the mammal undercoat. Tightly coiled hair shafts get embedded in stratum corneum and are seen as small dark circles next to hair follicle. Hair can be extracted and rolled out but recoils. It is common in middle-aged males mainly on abdomen and bony prominences. Histopathology of CH shows the presence of a “river bed” dilated follicle infundibulum with entrapped hair shaft. 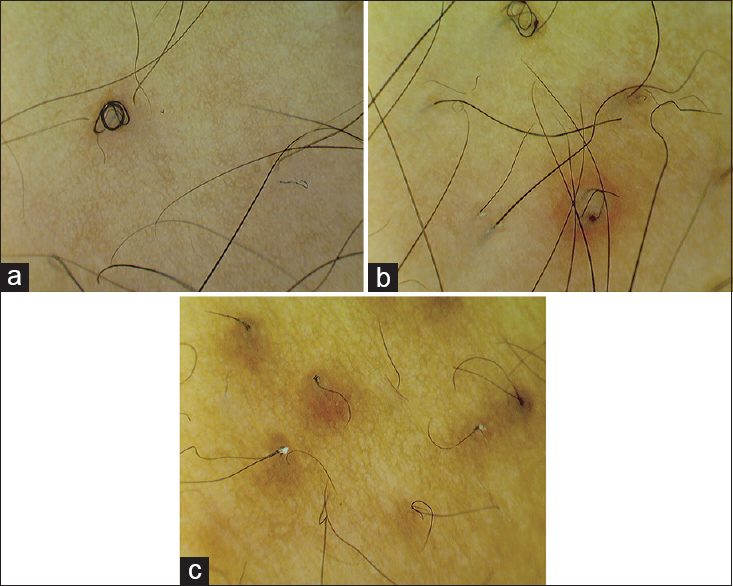 A 74-year-old obese man having sedentary lifestyle was diagnosed with irregularly shaped hairs since many years with no other dermatologic concerns. CH needs to be differentiated from rolled hairs, which is relatively common disorder of hair growth associated with follicular hyperkeratosis and keratin plugging. Rolled hairs are not perfectly circular and appear as irregularly coiled within a hyperkeratotic papule and are associated with signs of inflammation. Rolled hairs are usually associated with keratosis pilaris, scurvy and has also been associated with corticosteroid therapy, xerosis, neurodermatitis, atopic dermatitis, ichthyosis, and palmoplantar keratoderma. Dermatoscopy is very useful noninvasive technique for evaluation of such hair conditions, which can help in avoiding unnecessary histopathology as well as treatment with topical steroids for hyperpigmented papules which can cause various side effects. De Berker D, Sinclair R. Defects of the hair shaft. In: Rook A, Dawber R, editors. Diseases of the Hair and Scalp. Oxford: Blackwell Scientific; 1997. p. 239-98. Cambiaghi S, Barbareschi M, Cambiaghi G, Caputo R. Scanning electron microscopy in the diagnosis of pili multigemini. Acta Derm Venereol 1995;75:170-1. Lester L, Venditti C. The prevalence of pili multigemini. Br J Dermatol 2007;156:1362-3. Ciudad-Blanco C, Montero EC, Heffernan JA, Ochaita PL. Extensive pili multigemini over the back. Int J Trichology 2014;6:180-1. Argueta EE, Tschen JA. Hair with an irregular shape. Cutis 2014;94:E4-5.